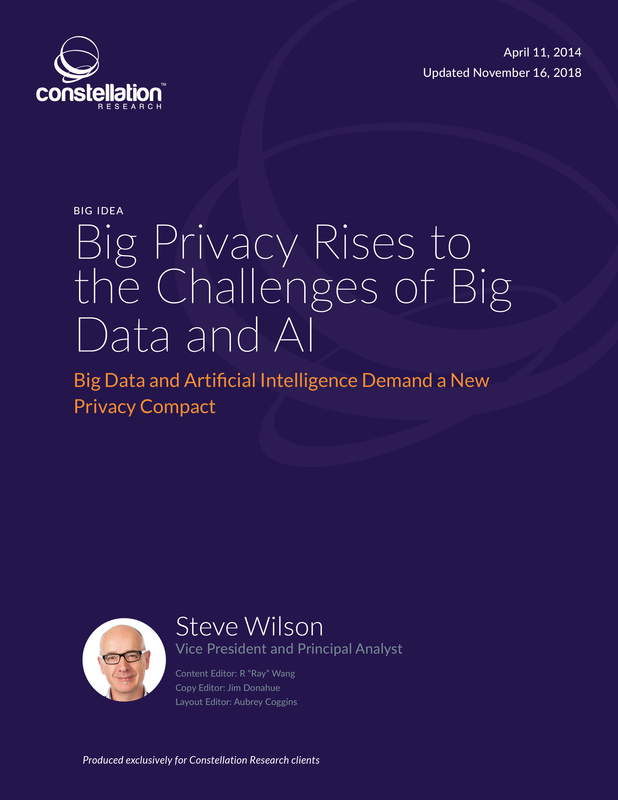 Big Privacy Rises to the Challenges of Big Data and AI | Constellation Research Inc. The fit among big data, artificial intelligence and data privacy standards is complex and one in which a dynamic balance must be maintained in order for new digital business models at the intersection of these emerging norms to ward off regulatory and consumer backlash. While existing data protection laws in Europe and elsewhere internationally are steadily strengthening, businesses should also be guided by fast-moving community standards. As communities increase their scrutiny over profits extracted from Personal Data, Constellation calls on digital businesses to exercise restraint with analytics and machine learning, to be transparent about their business models, to offer consumers a fair and transparent trade for data about them, and to innovate in privacy as well as data mining. This report makes the case for “Big Privacy,” a data privacy compact designed to enhance transparency about how Personal Data is collected and created, engender more restraint in how it is used and grant customers appropriate control over data about them. This report explains why Big Privacy is also a prudent business practice as it fends off aggressive regulatory measures, maintains customers’ trust and allows business interests and privacy to co-exist.